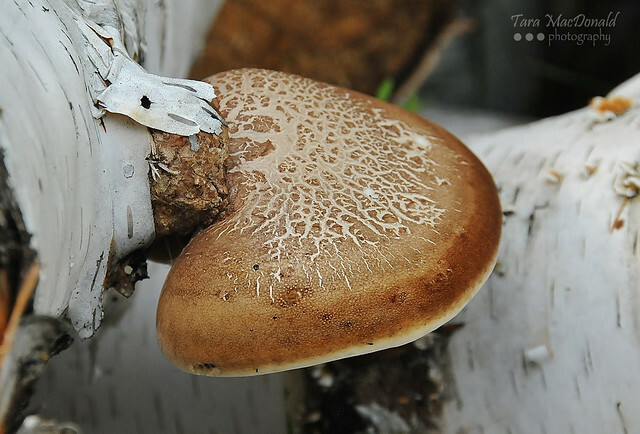 ECOLOGY: Birch Polypore is the most common polyporous racket fungi. Growing best in cold climates, it can be found almost exclusively in the Northern Hemisphere anywhere you find birch trees. While it grows mostly on dead birch trees, logs or branches, you can sometimes find them on living trees. Birch polypore has a rather nice mushroomy smell although the taste is very bitter. Caps can range from 5 cm to almost a foot long starting out as little white bumps, turning into soft but rubbery bulbous protrusions. As they grow older, they become flat, kidney-shaped and tough. The upper skin tends to be soft, smooth and white when young. As it ages, the skin remains smooth but it becomes browner. As the skin of the cap reaches the pore surface, you’ll notice that there tends to be a slight rim. Eventually the skin will crack and peel away from the flesh. The flesh itself is white while the pore surface begins as white but changes to a grayish-brown as it ages. Like it’s name suggests, the birch polypore doesn’t have gills. Instead, it has hundreds of tubes with tiny pores showing on it’s underside. The pore surface will be white, turning to grey and eventually black. The spore print is also white. There is often no visible stem, however if there is one it will be stubby and short. An annual fungi, the lifespan of birch polypore can reach up to a little over a year and you can easily find young specimens growing late into the fall. If you plan on eating the mushrooms, you should harvest them when they are very young, round and tender. As they grow bigger, Birch Polypore becomes so tough that they can only be used for teas and tinctures. When young, they tend to be more rubbery making it necessary to cut the stems with a sharp knife to prevent the fruit from going squishy. As they grow older and firmer, you can usually snap them off by hand. When harvesting older specimens, make sure that the porous underside is nice, clean and white or ivory coloured. You also want to avoid specimens that have a lot of bugs in them. The porous surface should be nice and clean looking. While young specimens are supposed to be edible, I tend to use a hot water extraction method. After harvesting, you can clean and prepare the mushrooms right away or let them sit pore-side up in the sun for a day to boost their vitamin D content. Remove the dirt off with a mushroom brush or vegetable scrubber and then slice the polypore into thin strips. At this point, you can use the mushrooms right away or dry them for later use. If weather permits, continue to dry the mushrooms in the sun until they lose their pliability and snap easily when bent. Another option is to dehydrate the slivers of mushrooms. Use the lowest setting and dry until they break when bent. After letting them air out a bit to remove any possibility for condensation build-up, store the dehydrated mushroom slivers in glass jars or another airtight container.Dehydrated mushrooms can be stored almost indefinitely. Making mushroom tea is a good way to extract the flavour and nutrients from tough, woody or rubbery mushrooms like birch polypore, turkey tail, chaga and other fungi that are too tough or leathery to eat. Once the mushrooms have been cleaned and prepared, you’ll want to simmer them in hot water to release the medicinal properties. Bring water to a boil and then reduce head to a simmer before adding your birch polypore. While many advise letting the mushroom simmer for at least an hour, I recommend a maximum of 15 to 20 minutes to avoid having the tea become too bitter. Drink your birch polypore tea right away or save it for later use. Birch polypore tea can be kept in the fridge for a few days or frozen into ice cubes. Add the liquid or ice cubes to soup or stews to enhance the medicinal value of your meals while masking the bitter flavour. Another great idea is to add the frozen tea to fruit smoothies. Yum! Sharpen Blades: Use the inner flesh of birch polypore to sharpen knives the same way you would use a sharpening stone (hence the name “Razor Strop”). Field Plaster: Cut a strip off the underside and use it as a makeshift bandaid or self-adhesive antiseptic field plaster. Tinder: Use dried out slivers as tinder. While it’s been used for thousands of years, birch polypore shot to fame when it was found along with the body of ‘Ötzi’, a 5300 year old mummy discovered by two German tourists hiking in the Alps between the borders of Austria and Italy. It’s believed that Ötzi – who was suffering from Lyme disease – might have used the mushrooms to help clear parasitic worms from the stomach and the digestive system. *Click here to learn more about Ötzi the Iceman!